Each volume contains original illustrations, case studies and examples collected as part of OU/BBC filming in the USA, Bangladesh and South Africa. 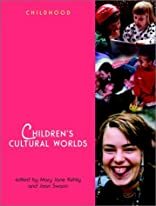 The third volume, Children's Cultural Worlds looks at the distinctiveness of children's cultural worlds by exploring the everyday activities of young children through to teenagers. Topics include friendships and the significance of play, how children use language to construct relationships and identities, the role of print literature, other media and information technology in children's lives, and their growing power as consumers. About Joan Swann (Editor) : Joan Swann is a published author and an editor. Published credits of Joan Swann include Learning English: Development and Diversity and Children's Cultural Worlds (Wiley & OU Childhood).